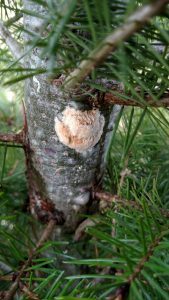 We often don’t think of gypsy moths as damaging conifers but it can be a big problem! Left unchecked young trees can be killed in a single season. 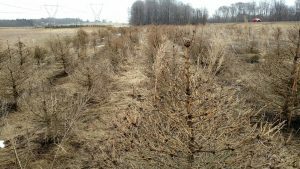 Spruce trees killed by gypsy moth defoliation in the 2017 growing season – Upstate NY. 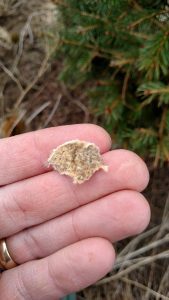 Scouting for egg masses in nurseries and Christmas tree plantings is important from autumn to early spring before the eggs hatch into tiny caterpillars. It’s not too late! Stick your head in the trees and look at the trunks to see if there any tan-white egg masses. Gypsy moth egg mass on trunk. Egg mass removed from tree. Egg mass broken up to reveal individual eggs. 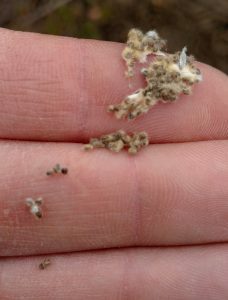 Recently hatched caterpillars on the egg mass. Normally the caterpillars begin to hatch outdoors sometime in early May. Young caterpillars on the move! These hatched from an egg mass that was left in the lab for several days at room temperature. 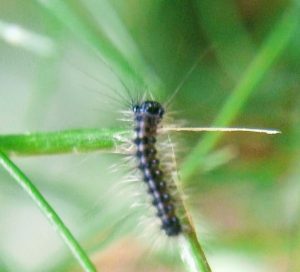 Close up of a juvenile gypsy moth caterpillar. 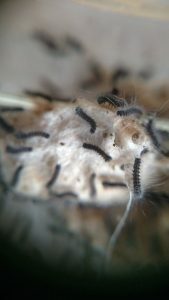 The young caterpillars are the most susceptible and easiest to control compared to caterpillars that have grown larger. For more information see the Cornell Insect Diagnostic Laboratory factsheet on gypsy moths. This entry was posted in Insect Pest and tagged Caterpillar, Gypsy moth, Spruce. Bookmark the permalink. Many growers see similar symptoms on their trees as we move through each unique growing season. This blog helps connect us and provide answers to problems caused by diseases, insects, weeds or the weather.